These are a great pair of original genuine Danish Modern Teak trolls, ‘Optimist and Pessimist’ designed by Hans Bolling, and made by Orskov & Co. Denmark circa 1960’s. A fantastic couple, comprising of the classic opposing character troll figurines the ‘Optimist’ and ‘Pessimist’. Both made out of teak, with rope arms and rabbit fur hair and painted eyes. 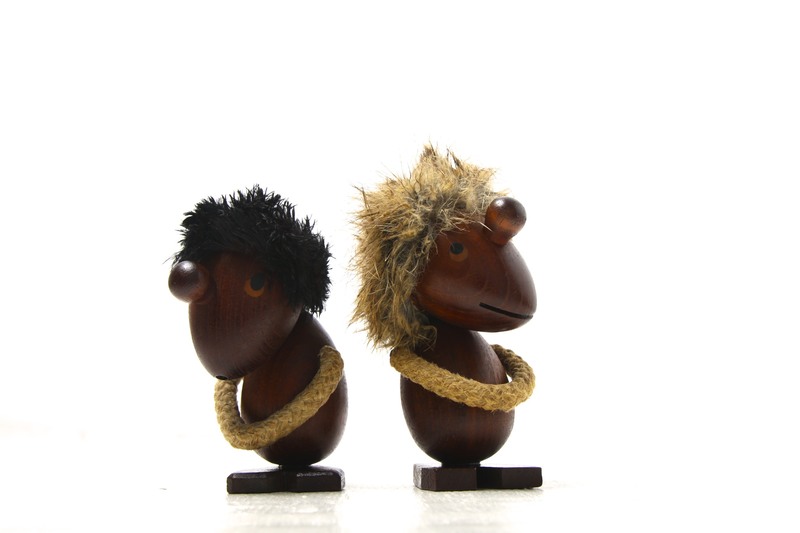 Designed by the renowned Danish architect Hans Bolling, famous for his iconic mid century wooden figures such as these. Stunning mid century Danish modern design classic, so reminiscent of the era, their small size would make them perfect to accessorise and add some fun character to a desk, mantelpiece or shelf. Would make a stunning addition to any Danish or Scandinavian Teak collection, and would complement any mid century modern, retro, vintage, 60’s, kitsch or contemporary styled interior. Each figure measures approx 14 x 8 x 6cm / 5.5 x 3.25 x 2.5in. Both stamped to the base ‘Hans Bolling Orskov & Co. Denmark’.